Do you send automatic updates for new titles by a specific author? 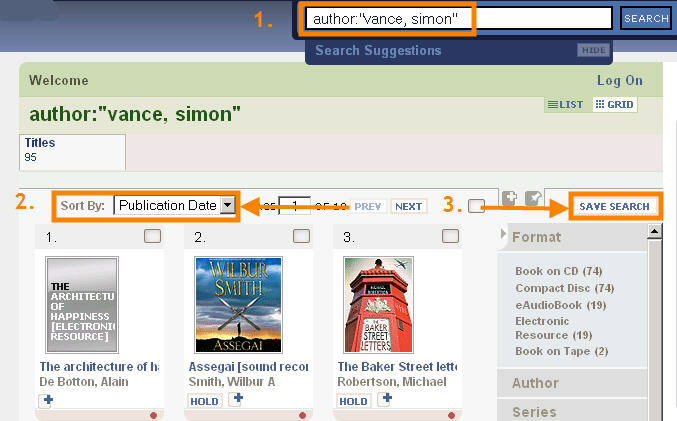 You can execute a search in the Catalog at http://catalog.ccclib.org/?section=browse&category=genre and save it. Items that are added to or deleted from the Library catalog matching your search will update your saved search results. 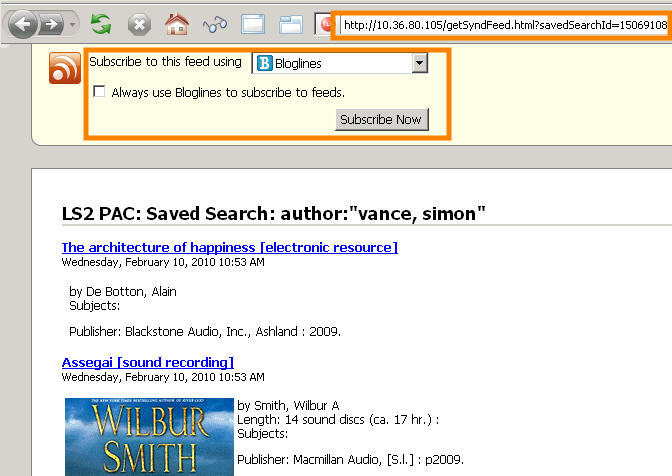 Save as many searches as you like and share them via RSS. 1. Search for items you're interested in. You can specify an author (or narrator), a topic (subject:knitting), words in a title (title:best), etc. If you need help formulating a search, ask your Librarian. 2. Sort by publication date if you want the newest results first and click "save search." 3. Type a name for the search and click the "+" button. 4. Access your searches by clicking the green "my saved searches" tab at the bottom of the page. 5. Click search or the search name to run the search. Click the RSS icon to get a URL that you can share by email or subscribe to in your RSS reader. 6. Copy and paste the RSS URL into an email to share your search results or subscribe to your search in your RSS aggregator.